These Law of Attraction tips for love are meant to guide you in all your relationships. They can help you find Mr. or Ms. Right. They can help you improve your relationships with your special someone. They can help you transform your relationships with your friends and family. 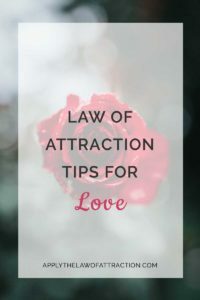 These Law of Attraction tips for love aren't about playing games or following any rules. They're about traveling through life surrounded by those you love while overcoming any obstacle that you find along your way, as easily as if you were to open a door with your right hand and walk on through. These tips are proven to help people find their true love, experience more romance, and have more fulfilling relationships. You don't have to be an experienced guru to apply these Law of Attraction tips. Even a newbie can apply them. Whether you want to manifest your soulmate or improve your relationship with a rebellious teenager, spend some time thinking about exactly what it is that you want. Focus in on the feelings. How will you feel when you have the relationship you want? What will it feel like to be with this person and have things between you be how you've always hoped they would be? What are the feelings you wish to experience? Once you have your answer, focus on the feelings. Don't focus on the person. Every day, whenever a thought about the person enters your mind, shift your thoughts to the feelings you want. Allow yourself to fully experience the feelings. Feel that you have the relationship you want right now. Feel that things between the two of you are exactly what you want them to be. Feel every feeling you want to experience as if you already have the loving relationship you desire. The Law of Attraction doesn't know if your feelings are real or imaginary, but it does use your feelings to create. Immerse yourself in the feelings you want to experience and feel them as if they are real. Don't go chasing after another person. Go chasing after the feelings you want to experience. Before you know it, the Law of Attraction will answer your request for love. Gratitude is the most overlooked element of relationships. The longer two people are in a relationship, the more they begin to take each other for granted. They forget what they love about the other person. They stop telling each other all the different things they appreciate about one another. They assume the other person knows how they feel…or they think the other person will always be there. If negative feelings come up between the two of them, gratitude gets even further lost. It doesn't matter if it's your partner, your spouse, your mother, or your brother, spend some time thinking about what's great about the other person. Focus only on the positive…the things you love and adore. Let them know. Nothing can re-kindle a relationship faster. Love yourself. Loving yourself tells the Universe that you are worthy of love. You become a vibrational match to love and draw love and other positive outcomes to you. If you don't love yourself, it doesn't matter how much anyone else loves you. You'll always be looking for something that only you can provide. If there's a hole inside of you that you think someone else can fill, look in the mirror and you'll see who can fill it. If you want someone to treat you right in a relationship, show them how to treat you by loving yourself. You won't put up for anything but the best when you love yourself. Make a conscious decision to love yourself and to have a happy and fulfilling life. Start by being nice to yourself. Put aside that little voice of criticism and self-doubt. Stop worrying and giving it power. Instead, praise yourself and acknowledge your accomplishments. Take your time with this. If you have to start slowly and tell yourself, “I love you,” when you look in the mirror, that's okay. If tears come to your eyes when you say it, that's okay. If it feels unnatural or wrong, that's okay. It will get easier. There is no one else exactly like you. You can choose everything about you – your clothing, your actions, your voice, your hair, your feelings, what you say… It all belongs to you. If you find that you've said or done or felt something that doesn't fit with who you are, you can let it go. You can keep what fits with who you really are. You are you. And that's wonderful! Before you know it, your most important relationship, the one with yourself, will be your most amazing, rewarding, supportive, and fulfilling relationship. If you believe these Law of Attraction tips for love are worth sharing, would you take a second to let your friends know about it? If it ends up making a difference in their lives, they’ll be forever grateful to you. So will I. Why is Love the Key to the Law of Attraction? So, I have tried your techniques on how to attract a specific person (read the book), especially an ex and it seems to have worked–sort of! I did what you said and we ran into each other one night, which is weird since we live in a massive city in 2 different neighborhoods. We talked and then went out a few days later and all seemed good–we get along really well. Then I did not hear from him for 5 weeks. It was one year since we met on Halloween, so I sent him a quick message saying that since it was Halloween, I was obviously thinking about him. He replied within an hour and asked me where I was going that evening and he showed up. We hung out and chatted, had fun and then planned to see each other again. We went out that week and had a nice time, but he told me he was confused, but that he has always liked me and wanted to spend more time with me but was not able to commit to me now. We agreed to spend more time together, but when I texted him later in the week, he was full of excuses about getting together. I then stopped contacting him. This past weekend, I was at the beach in a different part of the country and he was there at the same hotel as me! We ran into each other and we were both totally surprised by this. He was there with a friend and I was as well. He spent the first 2 days with us most of the time. I made no effort to see him, but he kept coming up to us–it was a really nice time. The last day, he was a bit weird and standoffish (which seems to be his MO) and right before I was leaving to go home, he then was very attentive again. While we were there, we did not talk about anything with “us” and he just said goodbye and that he will be in touch when he gets back to the city we both live in. So, my question is, do I just keep doing what you suggest or leave it go? I feel that he likes me but maybe he is not ready to commit or something. I just am not sure if I should continue or forget about it. I do really like him and would like something in the future, but his hot and cold behavior is getting old. Please advise. Thanks! Great work on what you have created! It can be just the beginning of something with him if you want it to be. If you still want to attract him, you should keep doing the techniques. If you want to move onto someone else, the techniques in the book can also be used to draw in your ideal relationship, not just one with a specific person. You might want to look into whether you have any fears, doubts, or other resistance that comes up that could be creating his hot and cold behavior. If you have any insecurities or aren’t sure if you can attract him back, you could be drawing him to you and then creating situations where nothing more substantial develops. Remember that you create everything about your reality. How are you creating your current situation? If you do want him back, beware of your frustration over his behavior. It’s a lower level energy that can prevent you from creating a relationship with him. Get clear on what you want and live your reality from that point of view. Realize the world around you is an illusion. You’ve created what you want and it’s just a matter of the world catching up to you. Hello Elizabeth, I am a follower of all your teachings and Thank you so much for this. I feel like you are my guardian Angel. I have romantic interest in a specific guy. I visualize us together. But it seems like I visualize it as a third person. I see it like Im watching a movie. So is it work for me? I explain how to visualize to manifest a specific person in my book, Manifesting Love. It wouldn’t be fair to people to have bought the book for me to give away information in it for free. I read your book and it really gives me hope. I was in a short relationship (couple of months) with someone, but after he ended it I want him back. I blame myself a lot, because I made so many mistakes – on a vacation I become emotionally a little unfaithful and somewhat apathetic towards him. But also, I didn’t have my energy centered around me as I was physically exhausted (from a flu and lack of sleep). Later my trust was shattered (when he intended to break up the first time), I became emotionally unfaithful again, and at some point I became needy and insecure so he even may have lost respect for me. Before the vacation things went great. So it seems like too much has happened, and even after three months (we’ve only messaged three times in the whole time) I still miss him a lot and regret all the reasons why it ended. Can such a scenario be reversible at all? I’d never gotten together with a guy where I liked so many things about him, and I feel like I blew the one chance with the guy I really wanted. Can the LOA apply even in a case like this? May I have a chance to get my ex back and have a fresh start? Or will the negative memories be always stuck in his mind and mine? Dear Isabel – All things are possible with the Law of Attraction. Currently your vibration is keeping you apart from your desire through your focusing on the negative memories, guilt, fear, and self-blame. When you change your thoughts and raise your vibration, you will begin to allow your relationship to change. Hello Elizabeth, I have a crush on a guy. He is bit younger than me, (about 3 or 4 years). He is very friendly with me and so i thought he also likes me back. I wrote a letter to him and had no chance to give it to him. Now he seems to be ignoring me. What should i do now. Please help me. So I’ve read your book about manifesting love and it’s a good book. However I discovered that my ex and I might not be a good match afterall. So now I just wanted to attract love, my soulmate. I’ve already made a list of what I want. It’s difficult to visualize if you don’t have specific person in mind. I do feel good and uplifted about it. I know that I will find my soulmate. However after doing all the visualization work (and working on myself, I’m in a very good place right now ) , what’s next? Do I go out and actively look for a person? Register on dating sites? I am not a couch type of person, so I often go to places but never meet someone. Can you give me some pointers? Thank you so much!